Our most popular bag is the perfect do-it-all hybrid bag that works for day-to-day use as well as air travel. It features reflective outer material to reduce heat build-up on the board. 5mm padding around the bag keeps your ride cushioned from the cruel outside world. Two sizable pockets on the front of the bag store all your gear. The top pocket is wet/dry compartment for wetsuits and other wet items. Bottom pocket has a mesh drainage bottom that will fit your fins and other equipment. This bag has a heavy duty nylon handle and shoulder strap along with padded backpack straps. Tail end is padded with heavy duty nylon, rubber feet and stainless steel drainage holes. Heavy duty zippers complete the package. 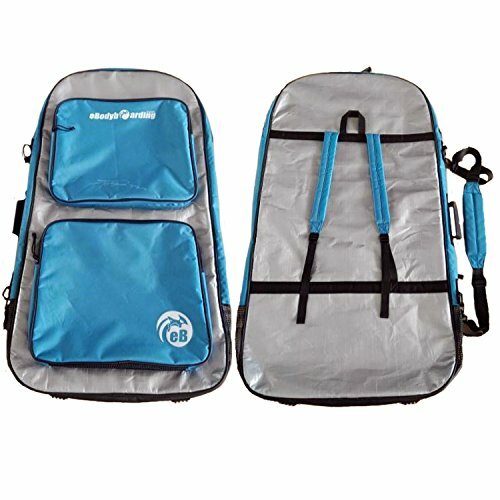 This bag has plenty of room to fit two boards up to 45 long, or one board up to 46 long, and could fit 3 boards in the 42 or under range. Colors: Reflective silver with light blue pockets and accents. If you have any questions about this product by eBodyboarding, contact us by completing and submitting the form below. If you are looking for a specif part number, please include it with your message.